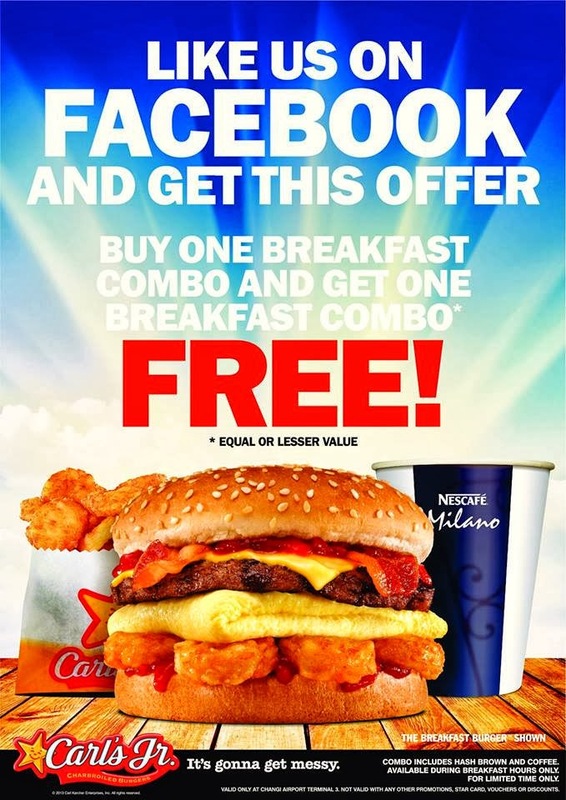 Singapore Freebies: Carl's Jr.: Enjoy Buy 1 Free 1 Breakfast Combo Promotion!! Carl's Jr.: Enjoy Buy 1 Free 1 Breakfast Combo Promotion!! It's back again!! Something to look forward to every morning..
Planning to fly off any time soon? Grab a hearty breakfast with Carl's Jr. The Signature items include the Portobello Mushroom Burger; Super Star®; and Western Bacon Cheeseburger ®. Pair those babies with our famous Beef Chilli Cheese Fries, a satiating drink from all-you-can-drink beverage bar, and guarantee you'll have a dine-in experience that's quite unlike any other. So when you've got a monstrous craving for awesome burgers at breakfast, lunch or dinner, pop in to any one of the 9 Carl’s Jr. restaurants in Singapore located at Jurong Point, Marina Square, Nex, Plaza Singapura, Playground @ Big Splash, VivoCity & Changi Airport Terminal 3.